Shallow fried lamb mince cutlets with flaky brown crusts and soft insides. This lamb kebabs recipe is perfect with hot parathas and cilantro-mint chutney! 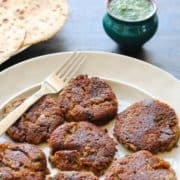 Lamb kebabs, also called shami kebabs, are an all-time favourite in my home and a life-saver for lazy days. The beauty of this lamb kebabs recipe is that it can be made in advance and the kebabs frozen in Ziploc bags. After you’ve shaped the cooked and ground mince into kebab shapes, line a platter with cling wrap and arrange the kebabs on it. Ideally, the kebabs should not be touching each other. Cover them with more cling wrap (enough to cover the whole surface), and place another layer of kebabs on it. Repeat until there are no more kebabs left and cover the topmost layer with more cling wrap. The cling wrap prevents the kebabs from sticking to each other. Place the platter in the freezer. When frozen, transfer the individual kebabs to a Ziploc bag and refreeze. The frozen kebabs will not stick to each now. When you have a hankering for some, just whip ’em out, shallow fry and serve! 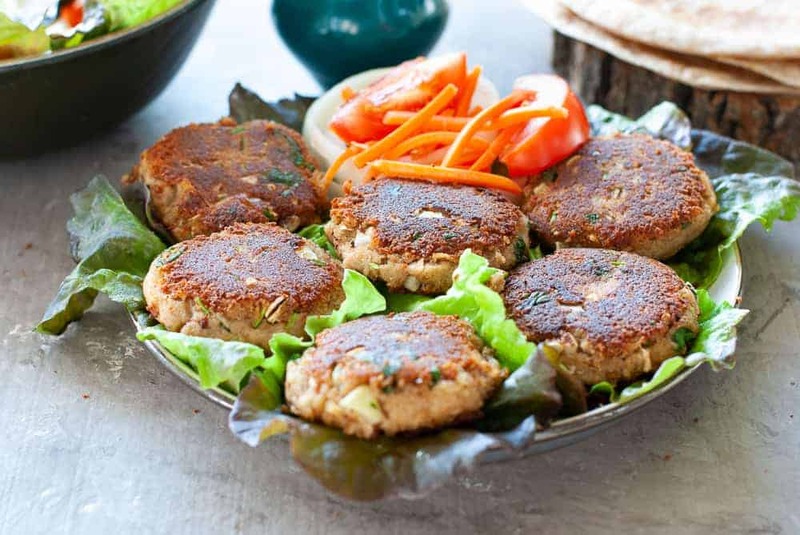 As a snack with salad and green chutney – Cut some greens and drizzle the green chutney on top of the kebabs. As an instant kebab roll – Spread one kebab on a roti or paratha (Indian flatbreads), drizzle some chutney or ketchup, top with sliced cucumbers and onions and roll it up. Voila! You have a ready-to-go snack all prepared. For brunch or lunch – Have a couple of kebabs with parathas on a plate, like a regular meal if you’re feeling especially ravenous. And why just bread, you can have kebabs with rice if you so fancy! There are no rules to follow here, people. Just go with what makes you happy. What’s your favourite way to have them? Shallow fried lamb mince cutlets with flaky brown crusts and soft insides. This lamb kebabs recipe is perfect with hot parathas and cilantro and mint chutney! Put the mince in a stovetop pressure cooker along with all the ingredients except the oil, omelette style onion, coriander leaves and green chilli. Do not add any water. Mix with a large spoon. After one whistle, turn down the heat to minimum and cook for 15 mins. Let the steam escape naturally and open the cooker when cool. Grind the cooked mince in a food processor and transfer to a shallow dish. The mince should have a dough like consistency. Add the omelette-style onion, coriander leaves and green chilli. Mix well. Apply a little oil to the palms of your hands and shape the mince into flat, round kebabs. 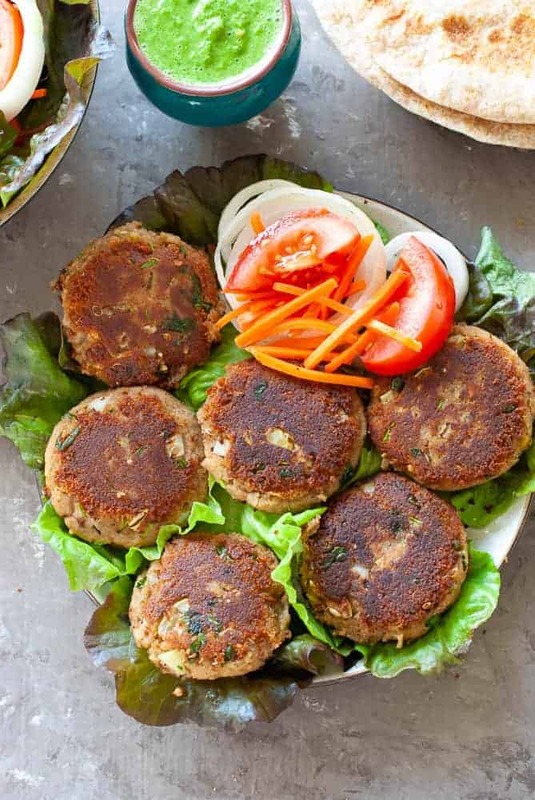 Heat oil in a shallow, non-stick pan and fry the kebabs on medium heat until browned and crisp. Flip and repeat on the other side. Serve hot. Put all the ingredients in a blender and blend till done. Serve in a small bowl with the kebabs. If there is water in the mince when you open the pressure cooker, don’t fret. Just cook the mince on a medium flame for some time until all the water dries off. Keep an eye on the mince though, don’t let it burn! If the mince has excess water, you won’t be able to shape it into kebabs. Split chickpea lentils (chana dal) are easily available in Indian grocery stores or in the international aisles of supermarkets like Walmart. If you can’t find them, add some cornflour to the ground mince and shape into kebabs. Some people also add egg batter or even cornflour to the mince. Whatever it is, be sure to add some kind of binding agent, or the kebabs will not hold together when you fry them. Did you make these lamb kebabs? Don’t forget to give the recipe a star rating below! Wow! This sounds so interesting. I had never heard of kebabs being anything but skewered! You learn something new everyday! The flavors sound awesome. 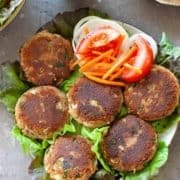 Yes, it’s a very traditional recipe and one that’s as delicious as skewered kebabs, though of course, very different in taste from the latter! So many ideas for these and my family absolutely loves lamb! But I would enjoy them just like this…with parathas and that yummy chutney! Yay, you’re with me then! Everything looks delicious, specially the chutney!! so yum! These lamb kabobs sound so flavorful. My husband loves lamb and I think he will love this. This sounds so flavorful! I’ve had lamb a few times and love the depth of flavor, so I could only imagine how good these are, especially with the Chutney! Glad you enjoyed them Disha!